Look at these pictures – these are among the most extraordinary looking cars ever produced… and yet people know little or nothing about them. And it gets better - not only do the cars look amazing, but their underskin technology is equally as interesting. These are the Tatras from Czechoslovakia. 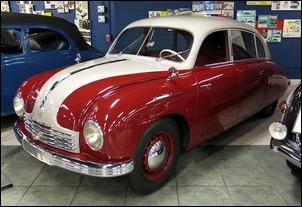 Tatra has existed in various forms since 1850 - along with Peugeot and Mercedes, it is among the oldest car companies in the world. They produced their first car in 1897, when the company was known as Nesselsdorfer Wagenbau-Fabriksgesellschaft. Famed automotive designer Hans Ledwinka then joined the concern, with his first design produced in 1898. By 1922 the innovative engineering approach had been set: the T-12 model used a large central tube to form the frame and had rear swing axles. At the front was an aluminium, horizontally-opposed, air-cooled twin cylinder using three valves per cylinder. Engineering niceties of the engine included a double-walled intake manifold where oil flowed through the hollow, both cooling the oil and warming the intake air. Pictured here is the Tatra T26-30 truck of 1927. It has six forward and two reverse speeds, and the four independently suspended rear driving wheels are able to have their axle differentials locked. At the front is positioned the air-cooled twin cylinder engine, and independent suspension sprung by a transverse leaf and friction dampers. The Tatra truck was so advanced for its time that this particular vehicle was anonymously purchased by Studebaker in the United States, who was manufacturing trucks for the US Army and wanted to investigate Tatra technology. But while the underskin technology was state of the art, the body shapes of the early Tatras looked much the same as other contemporary manufacturers. However, in 1934 all that changed with the release of the T-77. This extraordinary car not only used a 2.6 litre air-cooled V8, but the V8 was placed at the rear of the car. Despite still being wood-framed, the bodywork was startlingly aerodynamic, and all-round independent suspension was again used. Next was the T87 – replacing the T-77 after only three years. The T-87 was one of the most stunning cars ever produced. 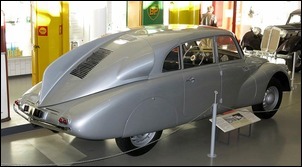 The all-steel monocoque body shape was curved and elegant. The rear wheels were covered and the door handles recessed. The body used a central rear fin – a real fin, for aerodynamic stability. 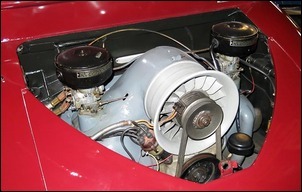 Scoops each side of the car provided cooling air for the rear-mounted V8, which was now a new OHC alloy unit featuring hemispherical combustion chambers and upsized to 3 litres. Power was quoted at only 53kW at 3600 rpm, but even so, this large car had a top speed of 155 km/h. When tested in 1979 in Volkswagen’s wind tunnel, the T87 was found to have a Cd figure of 0.36 – extraordinarily good for the 1930s. Making that Cd figure even more impressive is that the windscreen used flat glass: to achieve a curved airflow around the A pillar, inset extra glass panels were fitted. Under the car, a full-length flat undertray was provided. Rear suspension was by quarter-length semi-elliptic springs that provided trailing-arm location of the swing axles, while at the front transverse leaf springs were used. 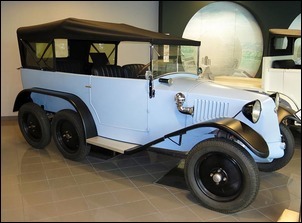 Three headlights were fitted – the T87 could not be mistaken for any other car of the 1930s! Under the front cover sat a 12 gallon fuel tank, two spare wheels (one with tyre and the other bare), two 6V batteries and an engine oil cooler. Inside the car was roomy, with front bucket seats that could be fully reclined to form a bed. 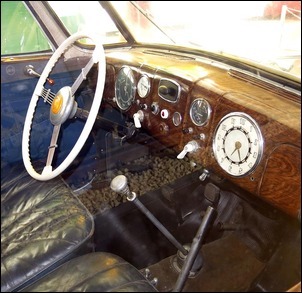 The walnut dashboard contained a mixture of white and black-faced dials, with a large speedometer in front of the driver and an equally large clock in front of the passenger. An oil temperature gauge was fitted. The steering wheel was white-rimmed Bakelite and a long gear lever sprouted from the floor. Vision was good - except towards the rear, where a view could be obtained only through the engine cover’s louvres. So what was the T87 like on the road? With its swing rear axles and rear-mounted engine, it is said that the car could easily leave the road tail-first. 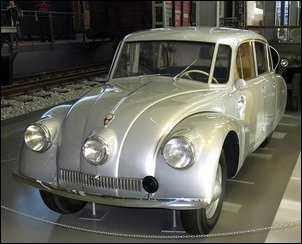 In fact, during WWII, when the car was kept in limited production by the Nazi occupiers, German officers were apparently banned from driving the Tatra! There is little or no noise from the engine… and all the gears seem equally silent. There is an excellent view out, both forwards and sideways, because the rear [seat] squab is not only well forward of the axle, but actually in front of the leading edge of the wheels. Steering is remarkably positive and has that smooth, turn-table feeling always provided by a good rack and pinion mechanism. [But] as we had expected, the big Tatra is a great oversteerer. Production of the T87 finished in 1950; just 3056 were produced. The T87 was always going to be a large, luxurious and fast car. But what of those people who didn’t require such a machine? For them Tatra produced the smaller T97. Similar in design layout to the T87, the T97 used a rear-mounted, flat four, air-cooled engine. 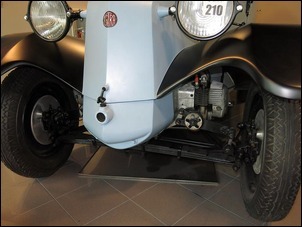 The monocoque construction body used independent suspension on all four wheels, and hydraulic brakes and rack and pinion steering were fitted. Manufacture of the T97 started in 1938 but was soon stopped: Czechoslovakia was invaded by Germany and on the orders of Hitler, production of the T97 ceased. Why? It was too close in design to the Volkswagen, a car about to be released. Post WWII, the Tatraplan was released. Compared to the previous cars, this model was made in relatively large numbers – 6342 being produced between 1946 and 1951. Body styling became a little more sedate, with the ducts for the engine cooling intakes integrated into the upper part of the engine cover. 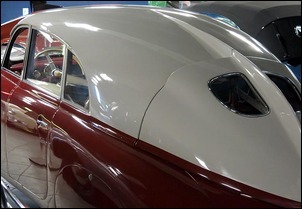 Rear windows were now also fitted, and the rear fin became much smaller. 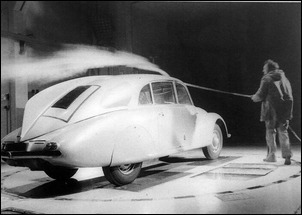 Aerodynamic testing of the body design was undertaken on the road using wool tufting, and in model form in smoke tunnels. Some references claim a Cd figure of 0.33; however this has not been independently verified. Top speed was 130 km/h. 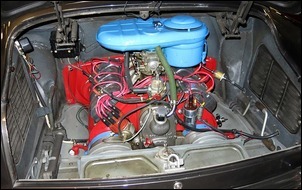 The Tatraplan used a four cylinder, horizontally opposed engine of 1952cc. Overhead valves were used and the quoted output was 52hp at 4000 rpm. Early engines used a vertical axis cooling fan and later engines - as shown here – had a horizontal fan. 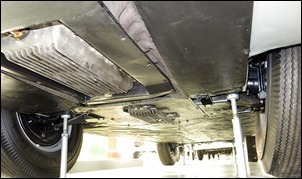 Front springing was by two transverse leaf springs, and the rear used torsion bars – both front and rear systems were independent. 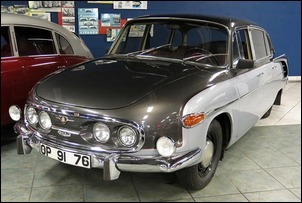 The most modern Tatra shown in this story is the T603. Produced in various models between 1956 and 1974, 20,422 cars were built – generally for use by Communist government officials. The cars were mostly hand built, often at a rate of only two a day. Sales literature was printed in English but few cars were exported. The T603 used coil springs all round, but in other areas the car seemed to have gone backwards, with valves in the V8 operated by pushrods, and engine cylinders made from cast iron. The engine’s swept volume was 2.5 litres and the power rating was 95hp (DIN) at 4800 rpm. Peak torque occurred at 3200 rpm and twin carbies were fitted. When describing the engine outputs, it needs to be remembered that compression ratio was only 6.5:1, allowing it to use the poor fuel then available in Eastern Europe. Side scoops admitted engine cooling air through filters, with the flow aided by twin scavenging blowers placed each side of the alloy crankcase and driven by V-belts from the crankshaft. 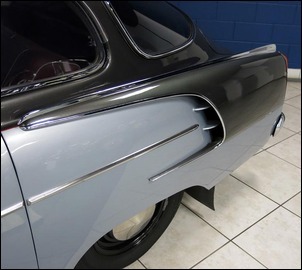 Air exits were through openings in the rear bumper, where thermostatically-controlled flaps regulated airflow. Inside, the dashboard looks very similar to American cars of the period. 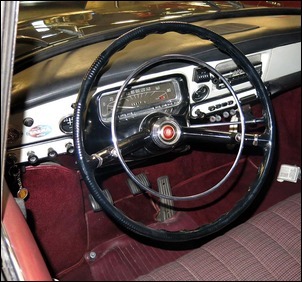 A large steering wheel is provided with a chrome horn ring – the steering requires just 2.5 turns lock to lock. The instrument panel is dominated by a rectangular speedo that runs to 180 km/h. Gear change is by column shift that control four ratios. 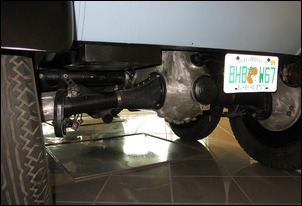 The suspension uses trailing arms at the rear and front sprung struts with trailing swinging arms. And on the road? A 1967 English review said the car was roomy, quick (0-60 mph time of 12 seconds - “which is a respectable sports car time”), and was excellent at high speed touring. But the writer severely criticised the handling for excessive oversteer. With little weight at the front, the turn-in is crisp with modest understeer, progressing through neutrality to a gentle Porsche-like pendulum effect as the weight of the engine way out back starts to take over. With its long wheelbase and unimpressive power-to-weight ratio, the 603’s handling is, if anything, more forgiving that a contemporary Porsche 911’s, but it’s still a brave man who will provoke dry-road breakaway. If the 603 hailed from […] a certain sportscar factory in Stuttgart then maybe we’d take it more seriously. 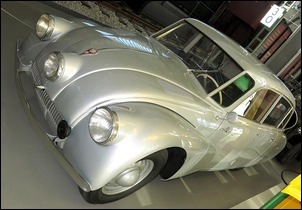 Tatra’s development of cutting-edge cars slowed after World War II, when the factory ended up in Communist Eastern Europe. 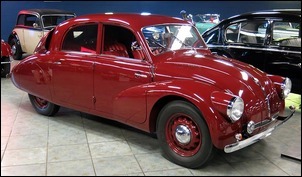 Production of Tatra cars stopped entirely in 1999, although the company still makes trucks. 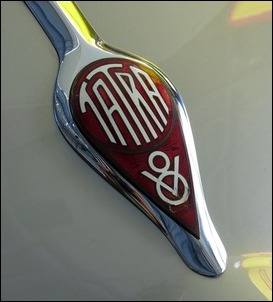 But pre WWII, its nearest design competitor was Ferdinand Porsche and his products: it’s not stretching credulity too far to suggest that if political history had turned out differently, the name of Tatra could now be as revered as Porsche in automotive circles…. 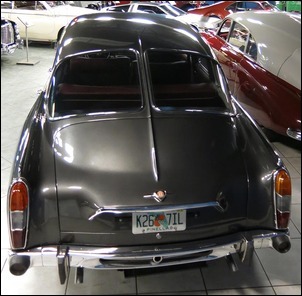 A good range of Tatras can be seen at the Tampa Bay Automobile Museum in Florida. A T87 can be seen at the Deutches Museum, Germany.